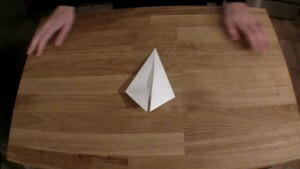 WATCH SCIENTIST JOE PERFORM THIS EXPERIMENT HERE! 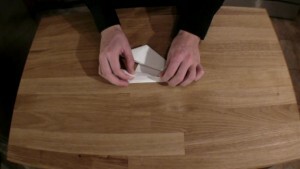 Start by folding the square in half corner to corner to make a triangle. 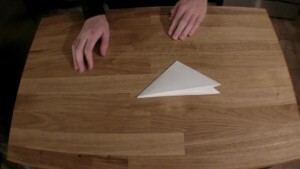 Fold that triangle in half corner to corner to form a smaller triangle. 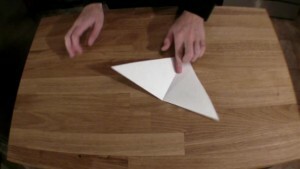 Unfold the previous fold to get the larger triangle. 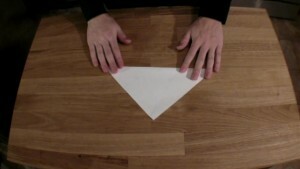 Fold the edges of the triangle into the newly-made crease to form a kite shape. 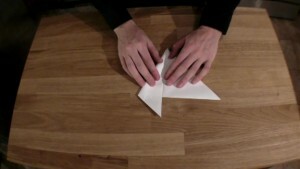 Fold the inside edges of the kite shape toward the outside edges as shown. 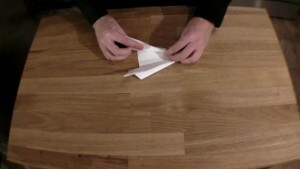 Turn the paper upside down and blow gently into the open end. Your hovercraft should zoom away! The pocket under the hovercrafts trap air and create a zone of high pressure. Further, the air moving over the craft has lower pressure. 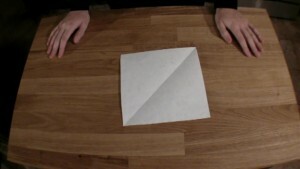 This difference creates lift and gets rid of the friction that normally holds the paper in place on the table. Without friction holding it back, a little breath is all it takes to get the hovercraft speeding on its way! 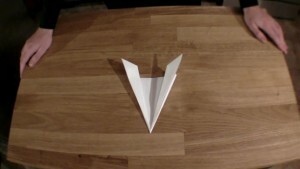 These little hovercrafts are so easy to make, it doesn’t take long to build some out of different materials (newspaper, cardboard, aluminum foil) or different sizes see which ones drive the straightest, go the fastest, or take the most breath to get moving!